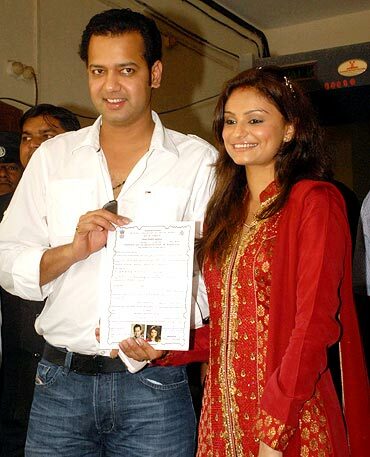 Dimpy Ganguly, who married Rahul Mahajan on national television via the reality show Rahul Dulhania Le Jaayega, is back on the small screen that made her popular. This time, however, she is acting in a serial called Kahani Chandrakanta Ki on Sahara One. 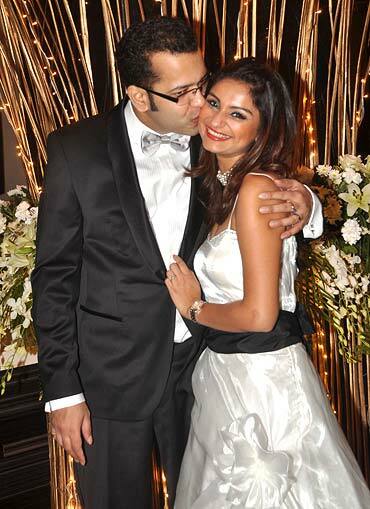 Just four months after their much-hyped wedding, there were reports of the marriage being in trouble with Dimpy accusing her husband of getting violent with her. But that, she says Rajul Hegde, is a phase most marriages go through. Why did you choose to make your acting debut in the Hindi serial Kahani Chandrakanta Ki? As a child, I loved watching historical and mythological shows because of their grand sets, jewellery, clothes and dialogues. Being part of it now is amazing. After watching Ramayana and Mahabharata, I would think how lucky these people are to get to wear such lovely costumes. I used to dress up as a kid and enact various characters with my mom's jewellery and sarees. I have done a couple of Bengali fictions earlier, but when I was offered this role, there was no way I could turn it down. Besides, it's not a negative character like most other nagins. What is your role in the show? I play the role of Naagin Jwala, an ichchadaari naagin who is plotting revenge on Daaku Mangal Singh for killing her lover Naag Jeewan, a male serpent. Did you do any kind of homework for this role? In the past, Sridevi and Reena Roy have played the role of nagins and have done a wonderful job. I want to recreate the kind of magic they did. So I watched their films and dances to understand the nuance. I have danced for one of the songs in the serial. Why did it take so long for you to come on television? I wanted some time to settle down after the way I got married. First, we had to understand each other, take responsibility of the house. I didn't have to do the household chores but I had to supervise things, which was something new for me. Rahul always encouraged me to work but I needed time and now, after two years, I feel it is the right time to do something for myself. It is hectic shooting for a fiction show but there is a lot of creative satisfaction when you are doing something different and your work is appreciated. Would you be comfortable doing a reality show like Bigg Boss? Why not? Actually, I was offered Bigg Boss soon after I got married but I was not comfortable then. In future if I am offered one, I will decide depending on the situation. I have heard lots of stories about the show from Rahul. Is films the next step? I want to be an actor, whether it's film, theatre or television. I just love acting, the medium doesn't matter. I haven't got any serious film offers yet, but I am open to the idea and would love to take it forward. The marriage brought about a lot of changes in my life. I thought it was important to give our marriage some time, considering that the circumstances we tied the knot in weren't normal. It's good to be a known face but I miss my privacy. I have no complaints because we also get a lot of love from people. I ignore it when I read negative news about us. So, you didn't get annoyed when things were written about your pregnancy? Yes, I did, because it was too personal. It is true I was pregnant. But since the doctors advised us not to reveal the news until the first three months, we didn't speak about it. I don't know how the news got leaked. My bad luck, I suffered a miscarriage after one-and-a-half months. It's a normal thing and I was fine with it. After your reality show wedding, there were reports that the marriage would not last long as it was a contract marriage. Comment. First, contract marriage doesn't exist in India. Second, why would I make a spectacle of myself? I don't need that kind of publicity. I don't come from a broken family. I come from a middle class Bengali family, where marriage means a lot. I am giving my best to my married life. What is your equation with your in-laws? They are the sweetest and most non-interfering people in the world. Everybody is happy that I have got back to work. Initially, you had trouble in your marriage. How are things now between you and Rahul? I think every marriage will go through that phase. Our relationship has grown stronger in the last two years. We have had our share of ups and downs but now we understand each other and everything is going good. Romantic? Not these filmi couples!